Even today, the basic laws of the modern world sound very radical: that states have the right to determine the system they live under, that minorities are protected within each state, and that states are sovereign. The small building called the Ratskammer (town hall) in Muenster looks similar to those around it, perhaps a few more decorative curlicues than the ones around it. Maybe a touch more gold. But in the mid 17th century the building in the featured photo was where diplomats representing 194 different European sovereigns gathered to hammer out a detailed treaty based on these principles. 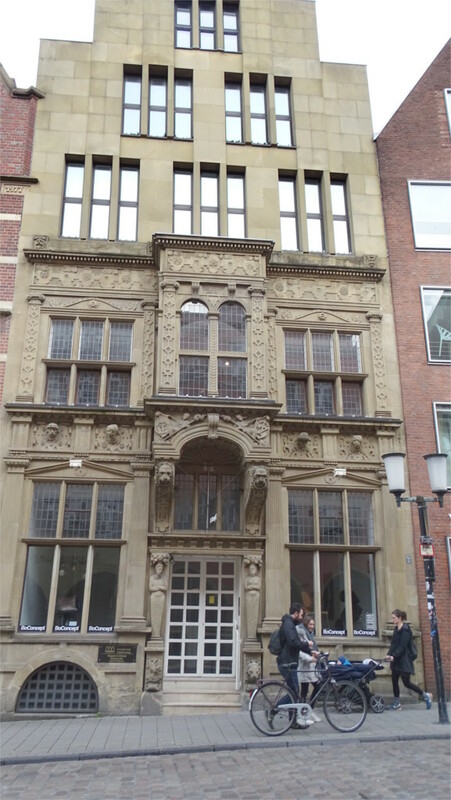 We entered the building and saw many little groups speaking Dutch scattered about the long vestibule. We bought our tickets and walked into a little chamber at the end of the hall. The richly carved wood paneling was the only indication that this room was so important in history. A muted recording looped over a description of the historical events that happened in this room: the haphazard gathering of diplomats, the negotiations, and the signing of two treaties, one of which gave rise to The Netherlands. I’d been here once more than thirty years back. Then, as now, I had a sense of alienation. Could the rules which govern the modern world have really been negotiated in such a small place? The Family walked around quite bemused. 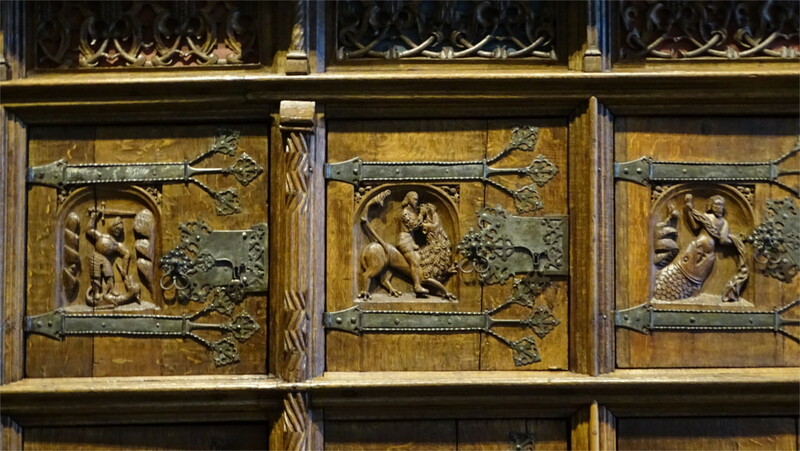 I busied myself taking photos of the wooden panels. Below them were hard wooden benches. I wondered whether the delegates brought their own cushions. Did they also bring their own food? The countryside around here must have been ravaged by a generation-long war. The room did look like the one in the painting by Gerard ter Borch, but that did not give the correct sense of size. Two of the walls were covered with portraits of the diplomats at the peace conference. I saw many Dutch names, some Spanish, some French, and others whom I could not map on to a modern country. I’m not a historian, after all. We looked at the portraits and tried to imagine the people behind them. I must report utter failure; these were people from a different world who could see that something new was needed, but never lived in the world that they created. What political compromises did they have to make? Over the centuries a place like this collects other things. 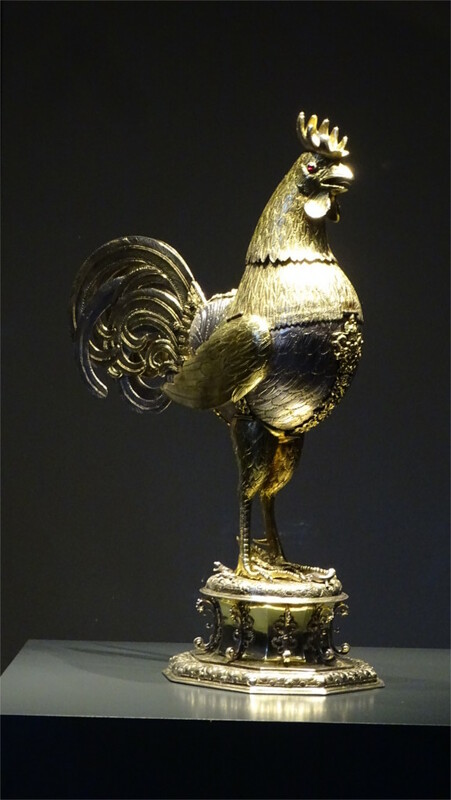 One case contained a golden cockerel which predates the negotiations. Apparently it can hold about one bottle of wine. This was offered to important guests of the city as an honour. Muenster was a Hansa town, and could presumably afford these small indulgences. 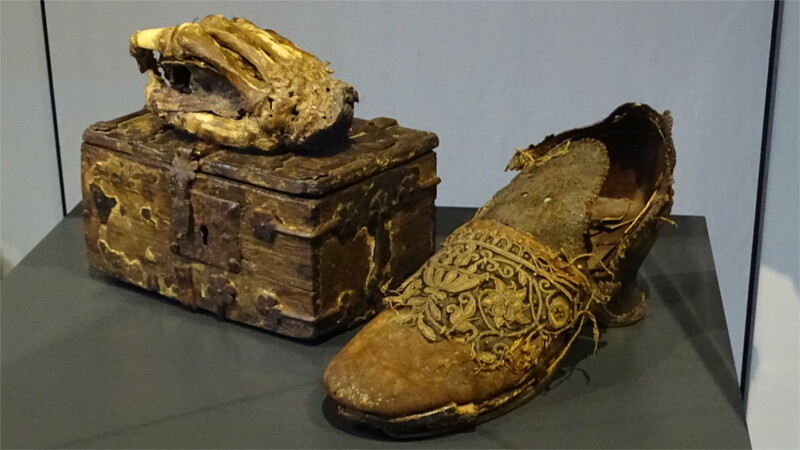 The really weird stuff was in a different case: one of a pair of slippers and a severed hand. There are no real explanations about why they are there, just a bunch of stories. Eventually you figure out that they are there because no one can make a decision to move them elsewhere. They just make the room look a little more odd. To think that absolutely revolutionary changes were made in a room where such small decisions cannot be made! The Uberwasserkirche in Muenster translates very simply to the church over the water. The name comes from the fact that the cathedral and this church face each other across the stream called Aa. The churches around here are old. This one was first consecrated in 1040 CE. The present building is from 1340. The tower took a long time to build, and was probably first completed in the 15th century. The post-war restoration of the church was completed in 1972, but the restoration of the tower was still in progress when we arrived there. The featured photo is of a very impressive looking doorway, but it is not the main portal. That was covered up by the ongoing restoration work. I looked more closely at the doors here and found that the design was very modern. The figures seemed to refer to the history of the church as an abbey where aristocratic women came to study. When you walk into a church in this area you see immediately who lost the war. All of this part was heavily bombed. While the structures of the churches have been restored, the insides are often bare. 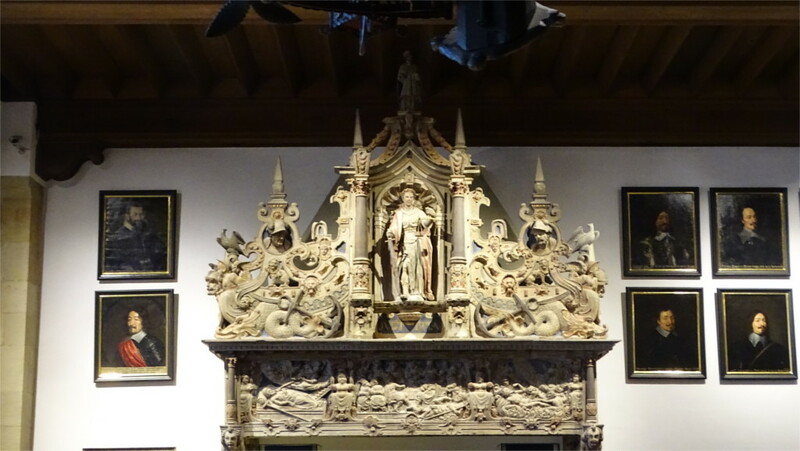 This large church had very few decorations, but what it had were these two fascinating sculptures in wood. They are really worth looking at in detail. We walked through the wonderfully restored center of Muenster, past the cathedral and came to the little stream called Aa which winds through the town. At this spot the banks were built up and planted with flowering bushes. Low brick houses lined the banks. The short path along the bank curved around the center of town and quickly reached a road full of traffic. We turned back, and came again to an interesting building hanging over the river, probably an old mill. The timber frame was filled in with brick. That is not so common, I’ve mostly seen timber frame and plaster as the traditional building material around here. Perhaps this was a newly built house; I’d seen advertisements by builders who would build you a wood frame house. 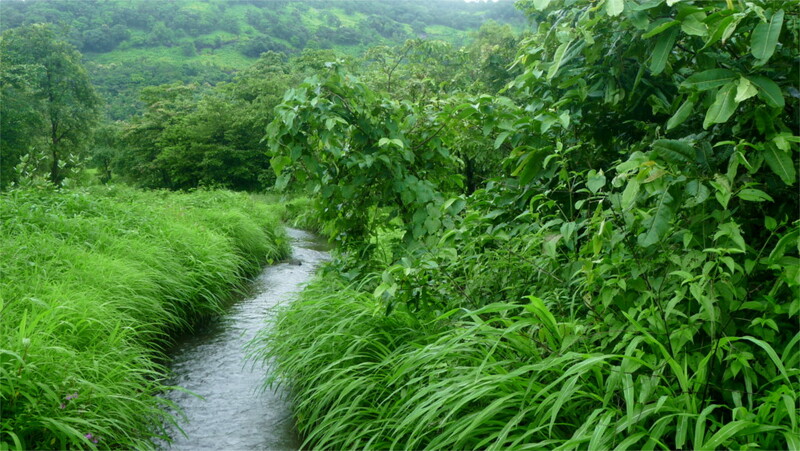 The mild drizzle and the flat landscape threaded by this thin stream reminded me of a different time and place. A few months earlier we’d spent a weekend in the flat land between the Western Ghats and the sea, a little south of Mumbai. During the monsoon this area is criss-crossed by little streams (one in the photo above) which join up into seasonal rivers which flow fast enough for rafting. There are no towns around, so most of these small streams have no names. It is interesting how the same landforms arise again and again across the planet. We wandered about Prinzipalmarkt in Muenster looking at the pretty buildings. Muenster had been a German army headquarters during the 1940s, and was heavily bombed by the US Air Force in 1943. So most of what we saw was rebuilt. The style is of the gabled houses common in this region from the 15th century CE onwards. The ridge line of the gables is perpendicular to the street, and the end that faces the street is built up over the roof into a high decorative front. We stopped at the building which you see in the photo above. 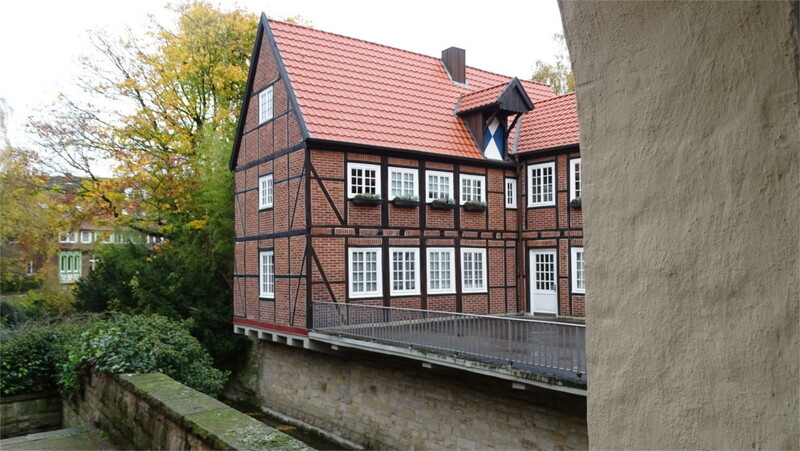 The upper three stories are clearly post-war reconstruction, but below that was the exuberance of a town flush with Hanseatic trade. Look at the lion heads at hip-height, supporting the front columns! The featured photo is a close-up of the columns: a mermaid and a merman, over whose heads hang carved flowers and fruits. The heads which decorate the lintel above the tall windows on the ground floor are also very interesting. They probably show how well-off people of that time dressed. Interestingly they follow a convention which you can see on TV news shows even today. When a man and a woman appear together, conventionally the man looks out at the world, whereas the woman looks at the man. How hard it is to evolve out of that convention. The headless figures above a trough near the entrance to St. Lamberti’s Church in Muenster (featured photo) seemed all of one piece with the bloody history of this town. The aggressive bicyclists in this university town probably channel the violent history of religious wars which swirled around this region in the 16th and 17th centuries CE. 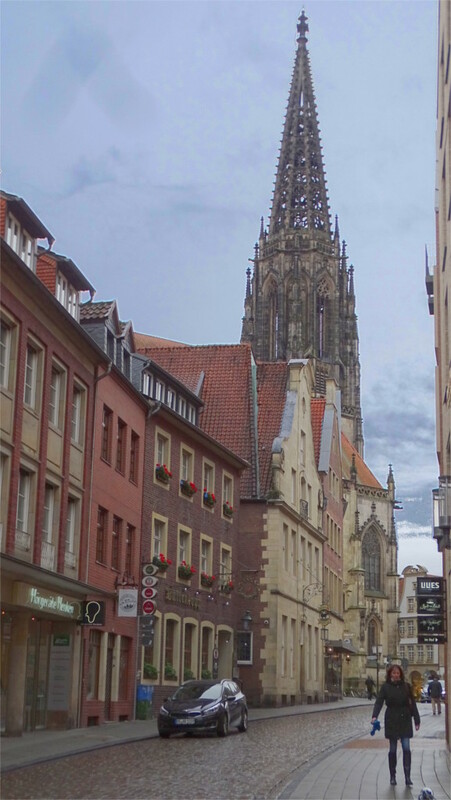 The spire of this church still has three empty cages where the bishop of Muenster had the tortured bodies of Anabaptist rebels left to die. A St. Lamberti’s church has been here from before the first recorded reference to it in 1189 CE; some say as early as 1000 CE. The present structure was about 75 years in construction, and was completed in 1450 CE. The tower had to be demolished in 1881 and rebuilt. The three cages were hoisted on to the new 90 meter tall tower on its completion in 1898. The bombed church was partially restored already in 1949, and the restoration was completed in 1978. If you have the misfortune to be selected as the Tuermer by the city, then you have to climb the tower every half hour between 9 PM and midnight to mark time by blowing a trumpet. The first woman to be struck by this bad luck is the current incumbent, Martje Solje. 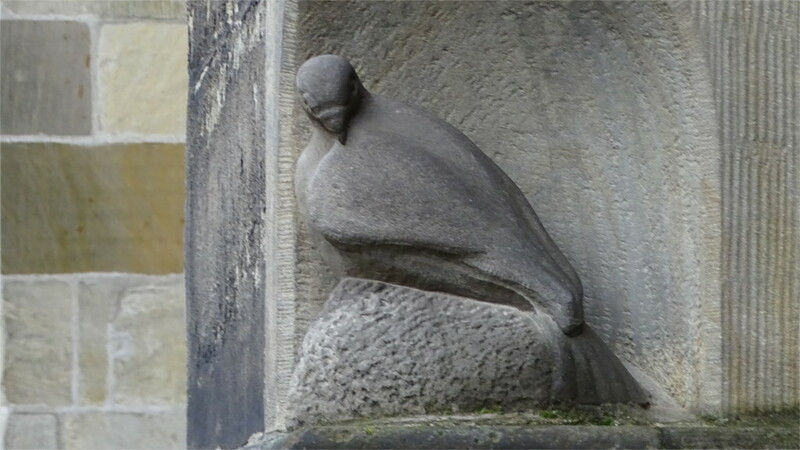 The stone dove near the headless statues was altogether different in nature. I couldn’t find any references to when this sculpture was installed. From the style it seems to be modern, and could well have been placed here during the post-war restorations. This would make it contemporaneous with the modern German pacifist tendencies. The inside was surprisingly bare. The main decorations were the wooden statues which are common in Westphalia. I looked at the gilded statue of St. Anthony of Padua and thought that anyone who keeps smiling as a child pulls at his scant hair deserves to be called a saint. I could sympathize with Anthony, but I preferred the expression on the face of St. Peter. We came out of the church and walked around to the main entrance from the square. This side of the building has wonderful Gothic windows and many sculptures. 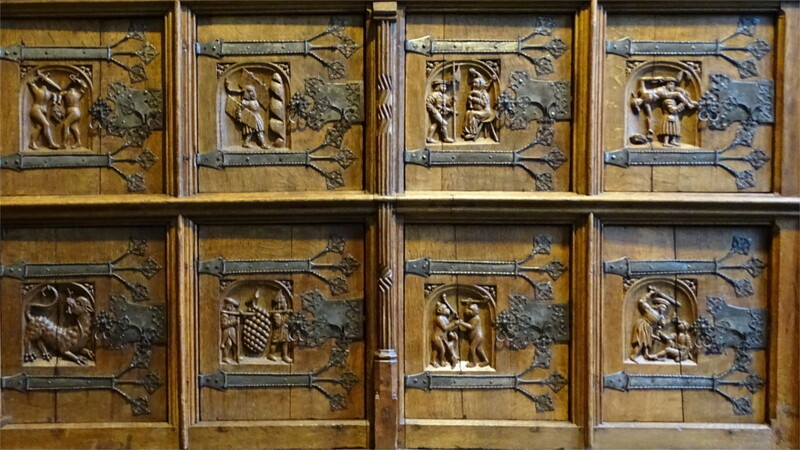 There was a greatly detailed panel which depicts the family tree of Jesus (image above). Apparently, the mid-15th century piece was made in sandstone which eroded in less than four hundred years, and had to be replaced in 1913. The statues of saints also were replaced at the same time. An interesting story about the four evangelists (photo above) is that the restored statues show Goethe as Luke (extreme left) and Schiller as John (extreme right). I wondered a little about the spikes around the heads of some of the statues. Medieval torture or stylized halos? It took me a while to understand that it was neither, just a utilitarian device to keep away pigeons. The relationship of this church with pigeons is worth pondering. 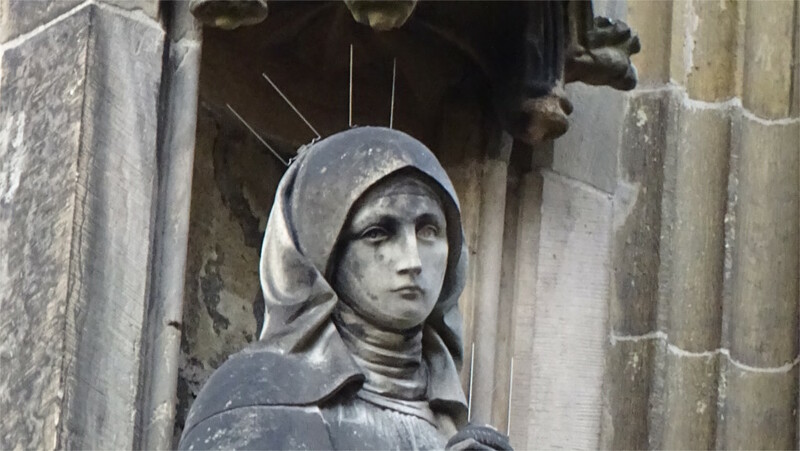 Some saints have pigeons thrust on them, others have spikes driven into their heads to keep pigeons away. Does the city realize how confusing this can be for a foreigner? There’s a fountain in the square in front of the church. Historically this was the graveyard of the church. Statues of a Westphalian farmer’s family decorate the well. I could not find a dating for this statue, but by the weathering you can see, it may need replacement in another hundred years. The red brick and sandstone church with the round dome that I was looking at turned out to be St. Clement’s. “Supposed to be Baroque”, I read from my guide to Muenster. It was a church by the architect Johann Conrad Schlaun, whose other famous work we had just walked past. The Family did not mind looking around. Inside was a profusion of colours: blue and gold being the major themes. It left us gasping “Rococo”. Unfortunately, a grille inside the lobby was shut. The church was closed. We peered up at the fresco on the dome. This painting by Johann Adam Schoepf shows the Apotheosis of St. Clements. That’s the featured photo. The painting seemed to continue into the window above the door which we had just entered. Inside we could see a baroque pulpit: red and blue encrusted with gold. The blue is apparently the colour of the Wittelsbach family, one of whom commissioned the church, which was completed in 1753 CE. The church was destroyed in the war, and the rebuilding and repainting ended in 1973. Off to our left was the main altar, and the little retrofitted organ was ahead of us. It seems that the organ was refurbished in 2014 to make it easier to tune and use. I wish we had come at a time when the church was open and the organ was in use. We left unsatisfied by this brief visit. We came into Muenster on a rainy Sunday in November. Muenster is usually very lively, but Sunday is a bit of an exception. Many things are closed. When we came to the beautiful building called the Erbdrostenhof, we found that it was closed. This is the work of the master German baroque architect Johann Conrad Schlaun. The building was completed in 1757. My first reaction to it was that it was much smaller and cramped than I had imagined it to be. Lovely details on that panel. The Family and I admired the three-winged building from outside the closed gates. The central facade is of sandstone, and the two side wings is faced with red clinker. These and the quartered windows are characteristic of the buildings that Schlaun designed. Unfortunately, since the building was closed, we could not go in to see the ballroom, which is supposed to be a marvel of restoration. We walked around to the back, but the walls there were high and did not let us have a good look. I guess we will have to go back to see this again. We visited Muenster on a Sunday and found that the city was barely alive. I’d hoped to find an interesting place which I remembered. I did find it, but it was closed. We turned to a pub nearby since it was full of families. This was not a bad choice, because we had a really wonderful meal. A meal at a pub is unlikely to be a fancy lunch. This was the next best: very well cooked local food. The Family really lucked out with her order of smoked salmon with Reibekuchen. You can see the crisp looking potato pancakes in the featured photo with a pot of mustard. The honey-mustard dressing for the Reibekuchen was characteristic of Westphalian food: a nice balance of salt and sweet. The Family was ecstatic about her food. Although my oven-baked meat was not photogenic, it was tasty in a very earthy and solid way. Well-cooked traditional food stands next to successful innovative food any day, as far as I’m concerned. So this this was a meal the two of us remember fondly. It is a pleasure to arrive in a city which is as full of bicycle as Muenster. Part of the reason is that there are a large population of students. Another reason is that it is a compact town, and a car would be overkill inside the town. We loved this “Bicycle Station” just outside the railway station: a place where you can park your bike when you take a train. Such a contrast with immense parking lots outside railway stations, as some countries have. Of course, the underground lot was full. That told us more about how successfully the city has weaned people away from driving. The city takes great pride in the fact that bicycle traffic in the city is larger than cars by quite a margin.